Once you're able to start moving rush over to the Grublins attacking the nearest building and start attacking them. Try and keep them from attacking the building itself and focused on attacking you, Cynder's Wind Breath and Spyro's Electricity Breath are the two that seem to be most effective at keeping them from doing damage. Keep doing this until you kill several waves of them and you trigger the arrival of some Wyverns. Once they arrive you now have to contend with some flying creatures attacking as well as the Grublins on the ground. Try and keep them at bay by knocking one back and moving on to the next one, going back and forth between all of them until they explode into gems. If you're running low of breath grab a Grublin and swing it about a bit. You'll eventually win and save the village. Saving all of the buildings will earn you an Achievement on the Xbox 360 version but nothing extra on the others. You can go save the game over by Hunter. Once you've done that it's time to head out into the Valley. At the far end of the village, just over the fence, is the first Blue Gem Cluster of the level. Fly over the river and right behind the tree is the first Red Life Crystal. Continue heading forwards following the river towards a waterfall up ahead. Just past some trees on the left near the waterfall is a second Blue Gem Cluster. Now go right up to the waterfall and jump onto the Climbing Zone to the left of the cave entrance. Keep going up and up here you should be able to find a piece of Regenerating Mana Bracers Armour for Cynder and a Blue Gem Cluster a little further along the river. Drop back down off the top of the waterfall and head into the cave at the bottom. Approach the restrained Cheetah and you'll be attacked. As you might expect your task is to kill these enemies. Once you've managed it Meadow will ask you to go get a raft, and to do that you'll need to visit a hermit. As you start leaving a rock behind where Meadow was held explodes leaving behind a chest with some Tail Armour for Cynder inside. Now leave and follow the river along until it forks. Take the left hand path along and just around the corner from the village you'll find the next Blue Gem Cluster on the side. Continue along this side of the river following it until you reach an upright log which you can push over. Either push it over now or you can just wait a bit. Head to the left and to the waterfall at the end of the fork in the river. Smash the two Blue Gem Clusters on either side of the waterfall and then land next to the door at the bottom of it. Open the passageway and walk into it. Head to the right when you get out of the passageway and go into a cave on the other side of the river, you should find another Blue Gem Cluster in here. Head up the slope and at the end to the left is a hidden Red Life Crystal. Turn around and head back towards where you entered the area, on the opposite side of the river from the entrance you should be able to see some Climbing Zones. Climb those zones and the game will teach you a couple new moves. First off it's the ability to jump quickly from zone to zone, just press the jump button right as you approach another climbing zone and you'll immediately jump again. Side effects to this move involve accidentally jumping when you should grab so this is a purely optional move. Wall Running however is something you'll need to get used to, this involves pressing the action button as you jump along a wall, this will cause your character to start running along it as if they were the Prince of Persia. Whilst the game will show you where it wants you to wall run by the scratch marks you can also run in other places that aren't marked as well, it's just not as necessary. Hold the run until you land on a platform over the river and then jump and fly over another platform on the right and up to another where the game will tell you how to jump off from a wall run. Double jump and glide hugging the wall on the right (don't fly) and perform a run and jump as you approach the ledge on the left. Making sure not to take flight land and then push over a log. This both provides you with a shortcut back here if you should fall and a way onwards. Jump up onto the brown vines on the wall, these are climbing zones except that they vanish after a short time of holding onto them so move quickly. Go up and then to the right dropping down onto a ledge at the end of a large bit of green climbing zone. Jump over the river and towards a large open area. Ambushed by skeletons known as Shadows you'll have to fight them off. 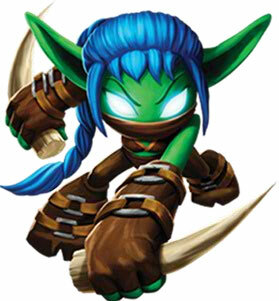 Luckily they're probably weaker than Grublins but there will be a lot of them. Once you kill them all the Hermit will provide you with the key you're after. There's a Blue Gem Cluster over in the corner and a save point up some vines on the right. From the save point either wall run or just fly over to the corner where you'll find the Hermit sitting and a chest with some Armour, Increased Fury Power Bracers, for Spyro inside. You might be able to manage a wall run along the next wall towards the Green Magic Crystal up high but otherwise use the climbing zone down in the opposite corner and jump up to it. Once you've got it fly down and follow the river and go through the passageway and back out into the main area again. Head straight forwards and across the river, go to the right on the other side and take the first left in the trees, here you'll find a Blue Gem Cluster waiting to be smashed. Continue heading along to the right and you'll find another Blue Gem Cluster up on some stepped platforms. A little further on go to the left as the river splits and on the right you will be able to see yet another Blue Gem Cluster, once you turn around from smashing it go straight forwards towards the door in the rock ahead, killing the enemies that pop up attacking you. Once you've gotten past them open the door and grab one orb. Taking two at this point would be just hindering you. Go back to the river and go left, the opposite direction to where the raft is. Go past the waterfall and put the orb down. Jump up the platforms just beyond the waterfall on the wall to the left and make your way up and into a cave at the top of it, you'll find the last bit of Armour in this level, the Increased Defense Helmet for Spyro. Jump out of the waterfall and pick up your orb again, just behind some trees further along is the twelfth Blue Gem Cluster, only seven more to go. And one of those seven is underneath a large outcrop of rock ahead, just next to the river. Go past it and to the left where there's a Climbing Zone on the wall. Carrying the orb as you go up the zone jump to the right at the top and then run along the wall onto the ledges. Jump up to the climbing zone above your head and walk along upside down until you reach the other end. Place the orb on the button to open the door and grab the Green Magic Crystal locked within. Fly down to the right and go around the rock and the trees heading towards the cave where you met Meadow. On the left you should see some platforms and climbing zones, climb them up to the top. Here you'll meet this level's Elite Enemy. Again notice the colour of its hat and use the appropriate element to smash it. Unlike the previous elites this is no Grublin, this is an Orc so it might be a bit more tricky to use grabbing moves over and over to defeat. Instead use Electricity to disarm him and keep him looking for his weapon as you batter away at his health until victory is achieved. If you have fury available then this would be a good point to use it for an easier win. Up here you'll find a Blue Gem Cluster and if you jump up to the left of it you will be able to glide over a bottomless pit to the last of the level's Red Life Crystals. Go back to the bottom of the climbing zone that you previously used to deliver the Adamantite Orb and jump on the platforms leading towards the river. There's a nice Blue Gem Cluster at the top. Glide towards the central pillar where you should be able to see the next Blue Gem Cluster. And just off a small drop to the left you should be able to grab the third Green Magic Crystal. Now it's time to go get the raft. Fly forwards along the river to a point where you can see a pair of wooden nets blocking the river. Land next to a control box in the middle and use both characters to turn the wheel until it is fully retracted (there's another closer to the village but you can ignore it for now). Turn around and head towards the place where you picked up that Adamantite Orb, this time pick up two and fly back to the place where you entered the passageway to the Hermit. Don't go through the passageway but you should be able to get up onto the land on the left side. Head up the slope towards the log, push it over if you haven't already, and cross the river. Continuing on along this path you should spot another Blue Gem Cluster to the left. Continue beyond it and through the trees, jump up a small step to the left and you'll be another Blue Gem Cluster closer to completion. Duck back a short distance and continue through the trees going left. You'll meet a dead end. Or rather you'll now need to climb some vines on the left. If you're on single player you'll need to keep switching between the two characters and both will need to climb up the vines, in two player you'll probably be doing that anyway, you just need to keep up with each other as the orbs make it difficult to follow otherwise. Once you're both over the cliff head towards the save point up ahead and drop the orbs on the buttons. Kill the enemies attacking you and save the game. Now go over to the raft, smashing the last Blue Gem Cluster over the river nearby, and use one character to hold onto it whilst the other flies, pulling the raft along as you go. Assuming you retracted the first nets continue onwards until you reach the second (if you forgot to do the first you'll have to get off and do it and then go back for the raft). Regardless of whether you retracted this second one or not the enemies will have put it back blocking your path. Get off the raft, it'll only float back a little here, and kill all the enemies near the wheel. Once they're all dead you'll be able to turn the wheel to retract the nets and get back onto the raft to bring it all the way to Meadow. Provided you've collected everything immediately speak to Hunter to finish the level and proceed to Warfang. Warfang, more commonly called Dragon City by the game, is your next stop in the fight. Epic. Beautiful. Just needs Elora then it's complete. This is my favorite lever. So peaceful. so easy too. i beat this level incorrecly and it took me a month to beat it! i can never EVER get past the hermit camp!!! i almost did it... but i made Cynder fly.. . and i fell i hate this level... i luv to fly around randomly tho in the cheetah village, i used Cynder's fury breath (unlimited health, breath, and all upgrades cheats, third armor set) none of the houses got burned down...LIKE A BOSS!!!! i LOVE this music... any one know how to make this my ringtone? THIS LEVEL IS BUEATIFUL.. FLYING IN IT MAKES ME SO HAPPY... I LOVE THE MUSIC BEFORE YOU FIND MEADOW!!! I ALWAYS REPLAY THIS LEVEL FOR FUN!!! how do u get the green gem cluster locked up?iv'e tried climbing but it didn't work? I really like this level! Not as great as Avalar from Spyro 2 but it's great! I love Spyro! I love TLoS! I love DotD! I love the Valley of Avalar! Everything in this level is great (apart from the start). @spyrofreak2360 - This is the best level in the game! You should find out how anoying the Golem Levels are! Then you'll wish that every level was this peaceful and easy! the songs in this part reminds me me of all the other games, just makes you . . . wonder.